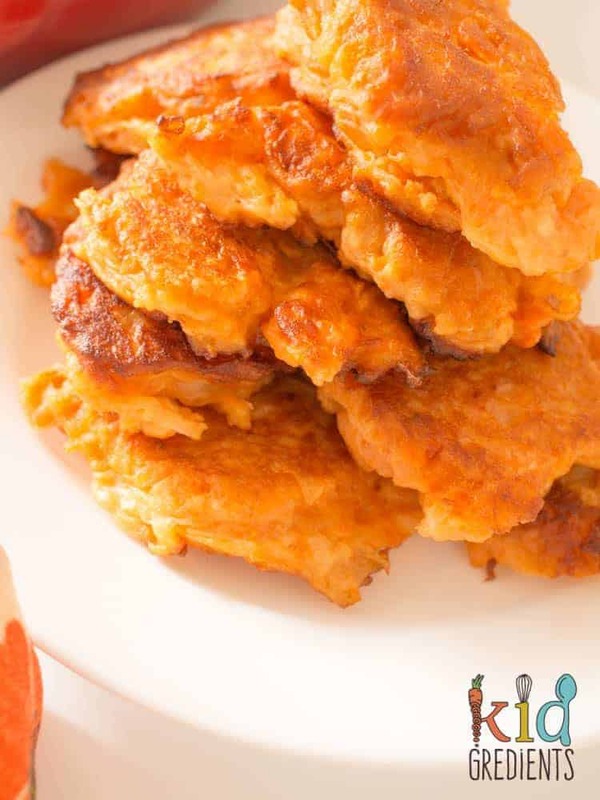 This post is an updated post with new photos, as these sweet potato and apple fritters are still a major favourite! Since remaking these this morning, both kids have had 3 each. I don’t like my chances of saving any for lunches next week. 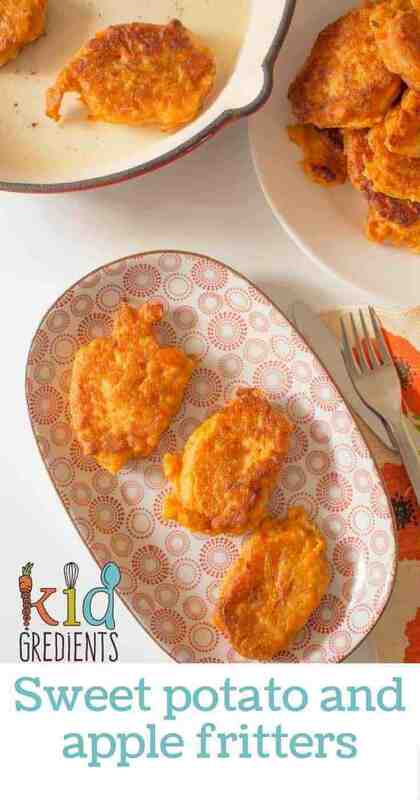 Fritters are a favourite at Kidgredients HQ. Both kids eat them, regardless of their contents! 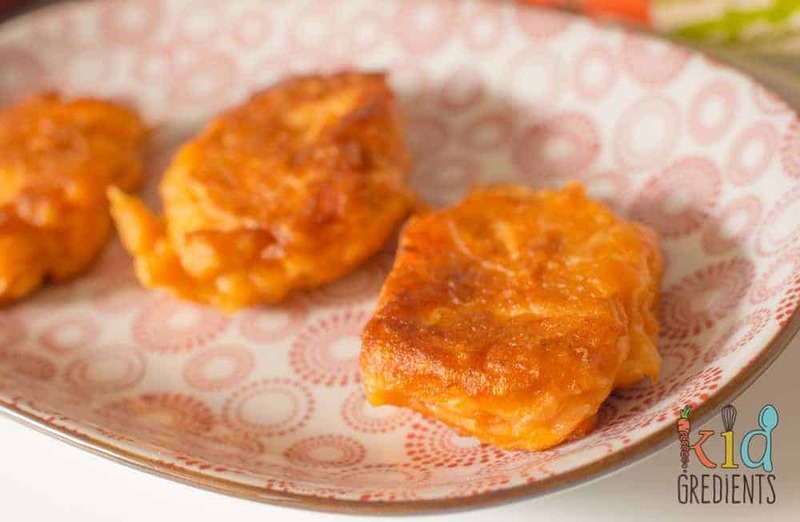 These sweet potato and apple fritters were winners! The first time I made them I made them gluten free by mistake (I pulled the wrong flour from the cupboard). And they were delish. So much so that Miss 4 demanded them for her preschool lunch. Properly demanded, with threats attached “if you don’t give me those fritters, I won’t go to preschool” (I always react to threats that involve non-attendance at preschool). Anyway, it turned out they really were quite yummy cold, as I experienced when I forget to heat them up at dinner time. Obviously it had been a great week. Anyway, they are yummy! Don’t read this thinking I’m crazy because I’ve combined apple and sweet potato. It makes them so tasty, savoury, but simultaneously sweet. Thinking back I remember now that apple and sweet potato was a favourite combo for miss 4 when she was a bub and eating puree. So it was already established as a winner. I tried frying these in coconut oil, but it wasn’t quite right, so if you can, stick to olive oil. They could possibly be baked, but I’ll leave that up to you to play around with. The sage really adds to the flavour in these and as you can see there is no salt etc, so please use the sage! hese are the perfect side for meat and three veg meals too, so maybe make a double batch if you want to have them handy. Cauliflower, broccoli and cheese fritters, 5 ingredients! 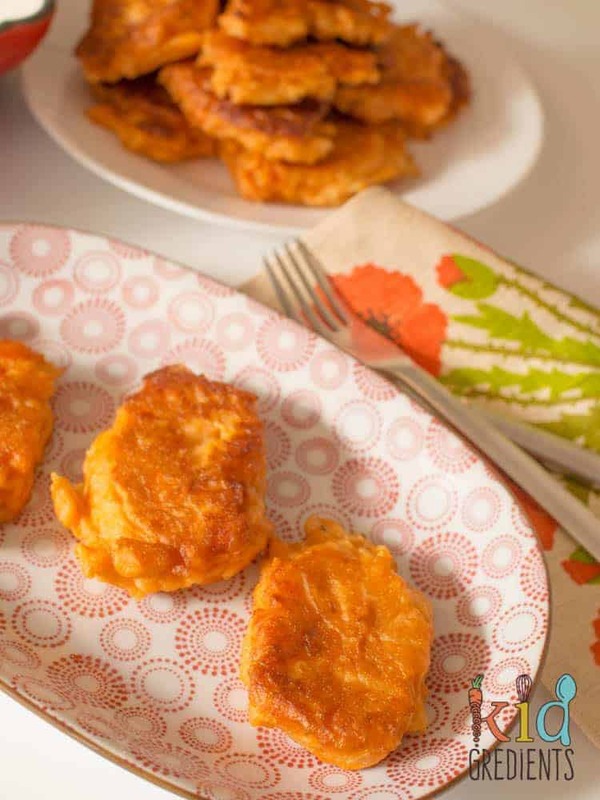 Baked zucchini fritters, 4 ingredients! Grate the apple into the mashed sweet potato. Add the sage, flour and egg. Heat the olive oil over medium-high heat. Fry tablespoonfuls of the mixture over medium- high heat until golden. Perfect for freezing for lunchboxes! The recipe says “cooked” sweet potatoes. How long should I cook them? Everything I’m finding online for diced sweet potatoes says about 30-45 minutes. Then, Are you saying to cut the apples in SLICES (for the fritter shape) and add them to the mashed sweet potatoes mixture? It’s a little unclear! 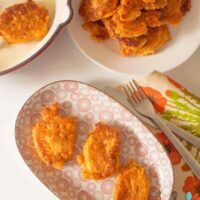 My son loves anything sweet potato so i’d love to try these! Hi Robyn, I cook the sweet potatoes until soft on the stove, in boiling water. They take about 15 minutes depending on the size of your dice. The apple is grated as per the ingredients list. 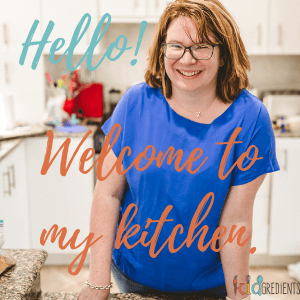 Can you use regular flour? Or whole wheat flour? Thank you! I roasted the sweet potato & blended it up, replaced the sage with a teaspoon of cinnamon and fried in half olive oil half butter – amazing. I dare you to try this version! An absolute fav in our house. That’s exactly what I do! I made these today, but cooked them in the oven (simply because I didn’t have time to stand by the stove to fry them!). I made them mini-muffin size, and they took about 15min to cook in a standard oven. Nice work! I hope you enjoyed them! How many muffins Did not make? How many fritters? It makes 20. If anyone is interested, I had success baking these in the oven at 425 on a well oiled nonstick pan. They cooked for twenty minutes and flipped halfway through. I love this and I’m going to try baking them! You could probably use a chia egg? It’s for binding, without it they may not stick together. Just a suggestion for future reference, as it’s obviously too late for your commenter, but I’d replace the egg with applesauce. 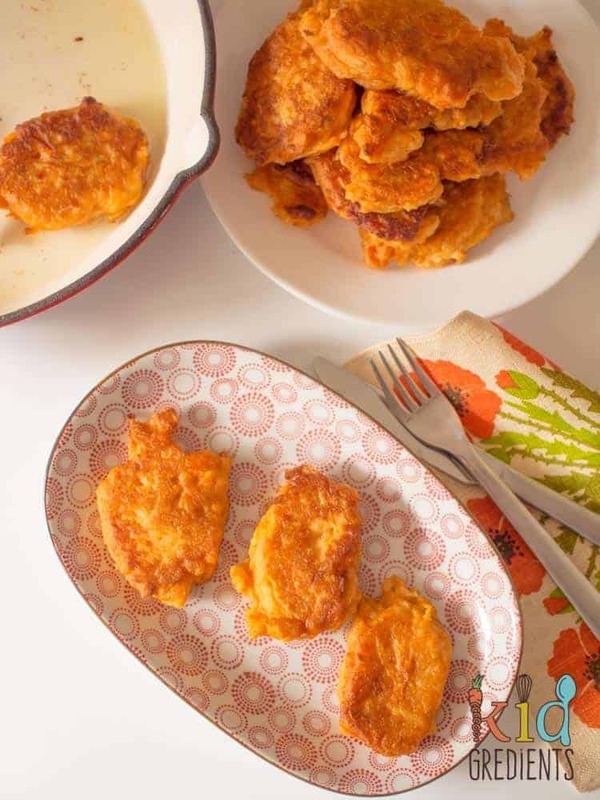 It’s often used in baking as an egg replacement, and would go great in this recipe! About a quarter cup per egg is the general rule. Maybe this is how I get my toddler to eat potato! I hope it works for you. Picky little eaters can be so trying! 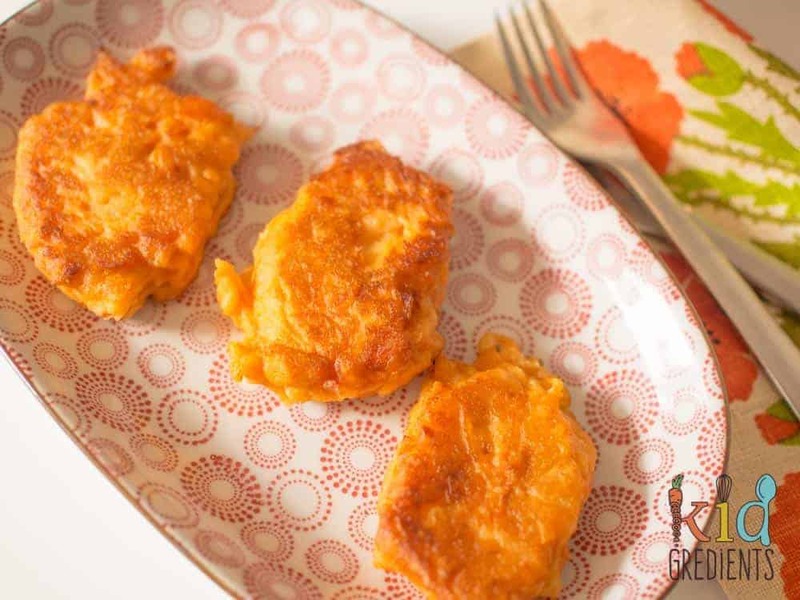 My boys loved sweet potato and apple puree when they were bubs too – will be giving these a go soon! These sound great, right up my alley. Thanks for having me Lucy! 🙂 we’re at the snow, having lots of fun already! I’m intrigued with the combination of apple and sweet potato. Will have to try it out! These sound so simple and tasty! I have some fresh from the garden white sweet potato. Kylie, will they be okay to use instead of regular sweet potato? Should be fine! Seasonal food at its best! Thanks Kylie for remembering us Gluten free people!